From the refugee crisis in Europe to the aftermath of the Nepal earthquake, humanitarian news has been dominating the news agenda. 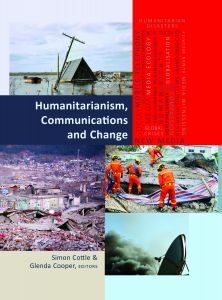 In response, a panel of experts will debate how we report such issues at the launch of a new book, Humanitarianism Communications and Change by Glenda Cooper (City University) and Professor Simon Cottle (Cardiff University). Academics, journalists and NGO workers will debate how the fast-changing nature of communications throws up new challenges but also new possibilities for humanitarian relief and intervention. What part can social media, crisis mapping and big data play in future crises, and does this challenge or complement traditional media? The book's editors will be joined by Ben Parker (Chief Executive, IRIN newswire), Prof Suzanne Franks (City University), Prof Richard Sambrook (Cardiff University), Leigh Daynes (Executive director, Doctors of the World UK), Brendan Paddy (Head of Communications, Disasters Emergency Committee), Randolph Kent (former Director of the Humanitarian Futures Programme), Kyla Reid (Head of Disaster Response, GSMA Mobile for Development), and Dr Mel Bunce (City University). The panel will be followed by a drinks reception and Glenda Cooper and Simon Cottle will be signing copies of their book. The event is being jointly held by City University's Humanitarian News Research Network, which brings together journalists and academics interested in the production, content and significance of humanitarian news.